It’s that time of the year where we witness celebrities styled in the best outfits to sashay on the red carpet for award functions. One such award night took place last evening, Zee Cine Awards, where we saw some spectacular outfits, while some of them didn’t really impress us. Zee Cine Awards 2019 was one such star-studded night where we saw actors like Varun Dhawan, Deepika Padukone with hubby Ranveer Singh, the heartthrob- Kartik Aryan and many more, attending this prestigious award night. Let’s take a look at what these celebrities wore for Zee Cine Awards 2019. One of the hottest divas of Bollywood, Malaika Arora, graced the red carpet in a bold red dress with hair and makeup on fleek. Be it airport look, gym look, brunch look or red carpet look, no one can beat this fashionista! She definitely made heads turn on with her high thigh slit, backless dress and the critics loved the look. Kartik Aryan has become the heartthrob of the nation with his commendable performance in movies like Pyaar Ka Punchnama 2 and Sonu Ke Titu Ki Sweety, and is all the rage these days. His recently released movie Luka Chuppi too is receiving a marvellous response from the audience. Moreover, Kartik was not only nominated but also hosted the award night alongside Vicky Kaushal. Kartik was seen in a classic black tuxedo paired with matte black heeled shoes in which he looked dapper as always. In the past year, his career has taken a leap with movies like Raazi, Sanju and Uri. He has won the audiences’ as well as critics’ heart with some awe-inspiring performances. His latest release Uri did extremely well at the box-office and Vicky also received accolades for his solid acting. We spotted Vicky Kaushal at the Zee Cine Awards 2019, wearing a white shirt, black pant with a black shimmer blazer. He paired it with shiny black shoes. The outfit suited him however, he could have experimented with the look this time. Hema Malini was honoured with the ‘Extraordinary Contribution to the Indian Cinema‘ award. She has done blockbuster films like Sholay, Seeta Aur Geeta, Satte Pe Satta etc. Also, she is renowned for her love for Indian classical dance. Even at this age, she performs at the Iskcon temple, Mumbai, on the occasion of Janmashtami. 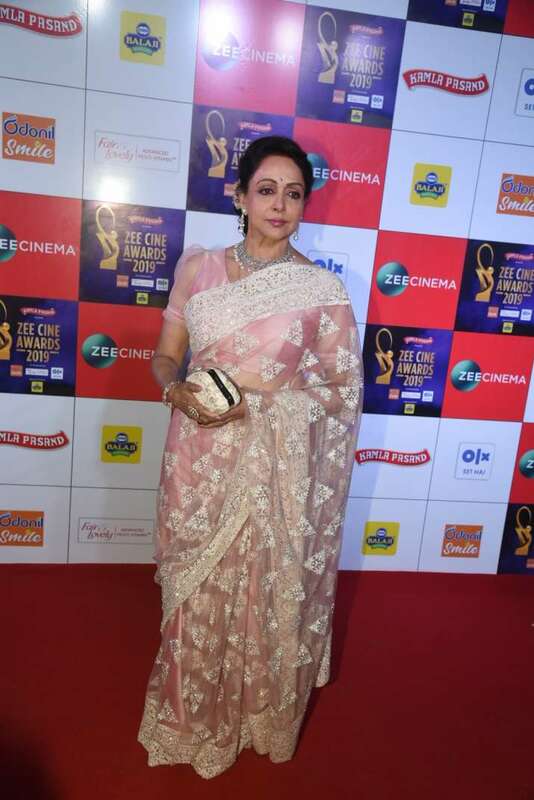 Hema Ji was spotted in a pink transparent saree with white ethnic work on it and a pastel pink balloon blouse. She kept the makeup simple and subtle. Hair was tied in an Indian bun and was accessorized using a broach. With minimal jewelry and a clutch, Hema Ji’s looked dreamy! Ranveer Singh Rocking The Carpet Look As Usual! He has been in the limelight ever since he announced his marriage with Deepika Padukone in November, and now his movies- Simmba and Gully Boy have done wonders at the celluloid. Singh donned a white shirt, black pants, and a quirky black-grey printed blazer. His hair and makeup were on point with accessories including round sunglasses. His whole look was dramatic yet stylish enough to impress us. Let’s take a moment to applaud Varun Dhawan for experimenting with his look yet nailing it like a BOSS! VD looked exceptionally outstanding in a tuxedo, inspired by the famous BTS’ songwriter and singer Jin. To keep it casual, he paired the suit with a simple pair to sport shoes. The cute and bubbly Alia Bhatt was spotted in a long sleeveless gown, which had floral print on it. She certainly looked like a fairy princess in the attire. With hair tied in a half pony and subtle makeup, Alia kept her look natural yet vibrant; jewellery included simple earrings. On the work front, Alia’s Gully Boy was a blockbuster hit and she’s all set to captivate us with her character ‘Roop’ in the upcoming film Kalank. Furthermore, her movie with beau Ranbir Kapoor ‘Brahmastra’ is expected to release at the end of 2019. Katrina Kaif Bags An Award! It was undoubtedly one of Katrina’s best evenings as she won the award for ‘Best Supporting Actor (Female)‘. She wore a black-grey net gown with pastel print. To enhance the look, she accessorized using a golden belt tied in a bow. Beachy wave curls, small earrings, and a radiant ring were all enough to compliment this diva’s fashionable outfit. Let’s just say that it’s the happy phase of Deepika’s personal as well as professional life. Lately, she inaugurated her wax statue at Madame Tussauds, London and got hitched with Ranveer Singh in November, last year. Though her film which released in 2018 had to go through a lot of controversies, she managed to stir the audience with her performance as Rani Padmavati and also won the ‘Best Actor (Female)’. Deepika arrived in a red backless gown with a sleek hairstyle and a bold red lipstick. There was not much in the look though she walked gracefully at the red carpet, smiled her way through to the shutterbugs and looked no less than a sensation. We just can’t stop adoring what these celebs wore last night. Let us know, in the comment section below, what you’ve to say about their looks and who impressed you the most. For latest fashion and styling updates, download the Marsplay App.